recruitment are 54 posts. Candidates having essential qualifications can apply for this CG Vyapam Inspector, Fieldsman and other vacancies through cgvyapam.choice.gov.in official website. Application forms can be submitted through online from 8th January-2018 to 22nd January-2018. CG Vyapam Inspector, Assistant Inspector jobs Recruitment selection will made through written exam and Interview. Written test admit cards will be available from 5th February-2018 and exam will be held on 11th February-2018. 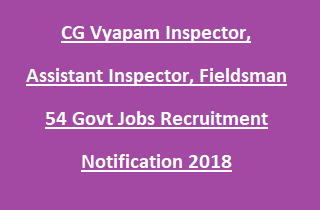 More updates regarding CG Vyapam Inspector Jobs Recruitment Assistant Inspector, Fieldsman, Field Investigator vacancies recruitment method, application procedure, exam pattern are mentioned below. Total vacancies has been released by Chhattisgarh Vyapam Recruitment are 54 posts. Total no of vacancies: 54 posts. 1. Inspector (Executive): 05 posts. 2. Assistant Inspector (Executive): 02 posts. 4. Assistant Inspector (Technical): 08 posts. 5. Field Officer: 03 posts. 6. Jr Reshem Inspector: 15posts. 8. Field Investigator: 03 posts. Assistant Inspector (Executive): Candidates must have passed 10+2 and degree in electrical/ Tailor/ Handlooms. See the CG vyapam notification for other posts qualifications. Selection for this CG Vyapam Inspector, Assistant Inspector, Fieldsman Jobs is based candidate merit in written exam and Interview. CG Vyapam Recruitment exam will be held on 11th February-2018. Admit cards available from 5th Febuary-2018. Interested candidates holding the above mentioned qualifications can apply for CG Vyapam Assistant Inspector, Fieldsman and other jobs using http://cgvyapam.choice.gov.in/ official website. Select the specific application form and submit in prescribed format from 8-01-2018 to 22-01-2018.